I travel with my peeps. 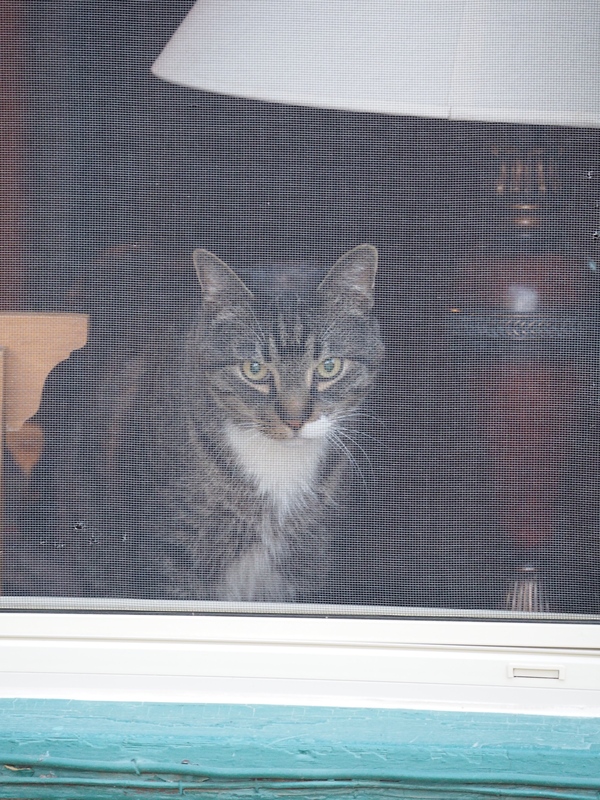 Here I am looking out of the cabin window when I visited in the high mountains a few weeks ago. MEOW! That would make a scaredy cat out of even the toughest of the tough cats out there (like me). I admit that I felt pretty lousy until my human learned how to help me feel better. It took a while. I heard my humans talk about giving me a shot twice a day. My slave said it was no big deal because she gave shots to her horse (she had a horse??? ), and her very old Siamese cat who had something called asthma. A friend of slave said that when her cat had diabetes that she always gave the cat a shot while she fed it. I’m cool with that. Feed me, stick me with a needle! We did make changes around the house. No more pet sitters for me. I’m always with my peeps because every 12 hours I must have my insulin. That means that I am in total control of what my humans do. I am so cool with that. The way I see it, I’m more important that going to a movie or a party. Wouldn’t you agree?